Trunk Club delivers fashion-forward advice to any device. Trunk Club was started to solve a simple problem: shopping for clothes in stores is overwhelming and inconvenient. With Trunk Club, you’ll discover great clothes that are perfect for you without ever having to go shopping. Trunk Club delivers top brands, expert service, and unparalleled convenience to deliver a highly personalized experience that helps you look your best. Trunk Club is a Nordstrom company, and is headquartered in Chicago, Illinois. As online purveyors of style, Trunk Club’s website has to look the part. How does their engineering team deliver an exceptional viewing experience for their customers? The Trunk Club team decided to take a cue from their company’s stylists. Rather than choosing an out-of-the-box CMS that would make their style guides and advice look like Yet Another Fashion Site, they built something completely fresh and new. 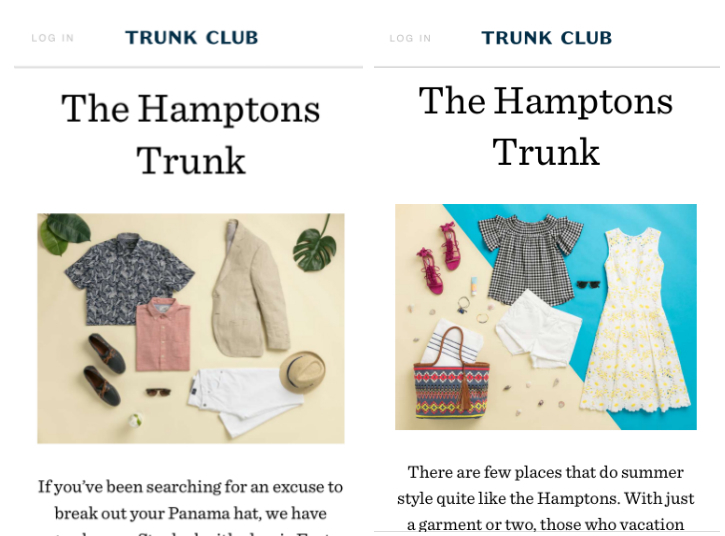 Trunk Club chose Contentful to be the heart of the custom-rolled CMS their team uses everyday. Create content once, publish everywhere. Trunk Club is owned by Nordstrom, and Nordstrom clientele expect an unparalleled online experience. Trunk Club's fashion advice and looks should be just as enjoyable on an Android app as they are on a 27” iMac Display. Trunk Club sought a means to end this redundancy forever when they found Contentful. Writers and editors received a simple Content Editor. Developers could then use a RESTful API to convert this text into JSON for both the web and mobile apps. 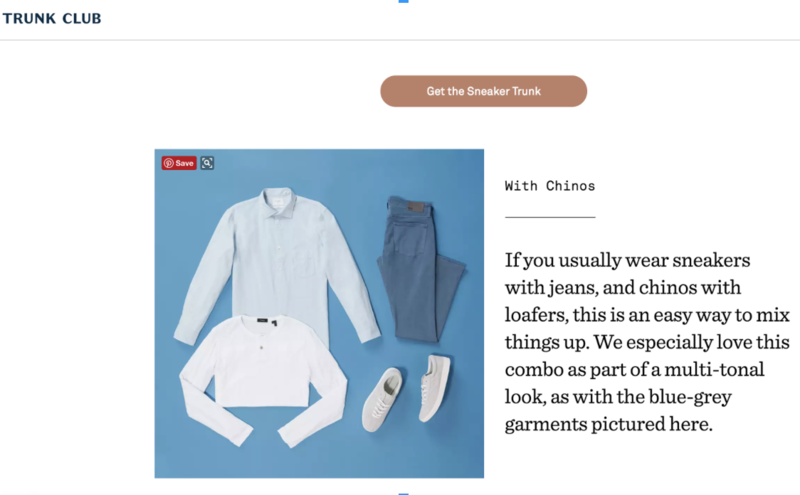 With a single content repository in place, the Trunk Club marketing team could focus on crafting valuable content for each screen size, not on the various CMS technologies they had to accommodate. Hughes's team began to incorporate Contentful, which runs on AWS, across all of Trunk Club’s tech stacks. By collaborating with the marketing team to build their content data model, the team created fields for long-form web descriptions as well as short-form mobile descriptions of every look, tip, or style. Our marketing team can craft, test, and optimize everything they write for every device. Demand for certain looks can skyrocket after an appearance on the red carpet or celebrity Instagram feeds. It's critical that Trunk Club stays on top of this demand with up-to-date advice, brands, looks, and style. Before Contentful, Trunk Club’s engineering team deployed every single change to the company's content. Not only was it a bottleneck for writers – it served as a consistent distraction for Hughes’s team. “Eventually, the engineering team decided that Contentful could be used to relieve them of a burden of publishing content updates,” says Hughes. They integrated it into the staging and production versions of each app. Then, Contentful was integrated into Slack using webhooks. The marketing team can trigger deploys anytime by typing a simple command in the dedicated channel. Contentful now plays an integral part of Trunk Club’s marketing strategy. The ability to produce and deliver content that provides sartorial advice and personalized recommendations is essential to the company. Our content provides Trunk Club with a way to maintain authority in the styling domain.